CUndoubtedly, furniture is the most important thing needed for the space designing of a new home or a workplace. The good furniture can change the whole outlook of any space, be it a home or an office. Considering the fact that furniture makes an empty house or office, a perfect and lively space to live or work in, the significance of a good furniture set is always highly rated. According to a survey conducted on the market competition, it was found that the local retailers were having different strengths but surprisingly, they all have the same effective presence in the eCommerce world. Although it was also noticed that some crossovers were carried out competitively in the furniture brands. And, in this striving and vying business world, DesignDeli lacked nothing in that aspect. DesignDeli brings out the new concept of customizing the design and buying the incredibly exotic furniture. They sell the total design package at one-stop store which includes exotic looking furniture, tool-racks, lightbulbs, whiteboards and other related stuff. DesignDeli’s furniture store is based in Berlin, Germany. Since 2006, it is ruling the world of furniture with its fascinating handcrafted furniture, racks and other stuff with customization option available. But, before their internet presence, it was really hard for Design-Deli to reach out to the customers. Although they could reach the nearby market, they were not able to extend their global reach. So, one day, the owner of the company just casually visited the office of Andreas Stadler (a famous Austrian writer/politician/scientist) and saw the beautiful rust artwork on his furniture. That day, he decided to adopt that design pattern on his furniture and thought to ake it available to the world. He knew that it wasn’t going to be easy because customizing furniture on the basis of online requests was a complex idea. But, he was persistent with that he is going to make this happen. So, they decided to grasp their online presence with the name DesignDeli. The owner wanted to build a website with this customizing solution for the furniture manufacturing. Even the owner himself explain the whole rust artwork in detail. When we heard the concept, we found it extremely fascinating and challenging. We started working on that and used the most famous technology in eCommerce web development- Magento. 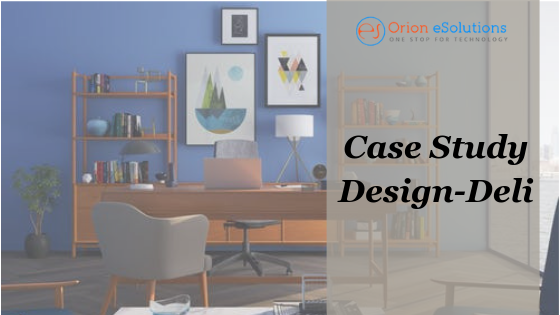 At Orion eSolutions, we have a team of professionals who keep themselves updated with the latest technologies and are proficient in delivering the most favorable results. We then designed the “information architecture” and send it to the client for approval. Then after, the non-functional prototype was made to make the understanding of the development process easy and transparent for both the client and our team. Finally, a fully functional website- Design-Deli was engineered. In this technology-driven era, companies and people are on the internet for information and services. People visit a website to find the information they are longing for. Creativity is one of their core competencies because of their design “System 180” and makes them stand out from the rest of the competition. So, now with their online business, they could reach out to the global audience. I am here to share a note that you guys did a brilliant job! My website – Design-Deli, functions perfectly fine and as per expectations. I feel so great to have worked with you. Looking forward to more business endeavors in the future!